You can see my “medicine cabinet” for bettas above. A lot of readers are curious what I would have in such a thing. A lot of people want to know how they can create one for themselves. In my kit, not only do I have medicine I have extra food, various foods, my aquarium salt and the chemicals I treat the water with. Something that is too big to fit in my tupperware container is the aged water. I have 5 gallons of aged water sitting in one of my cabinets that I use and refill on a daily basis. Now, remember, your medicine cabinet might not have exactly what I have in mine and that is quite alright. If you have something I don’t or you think of something that I don’t have, I would love to know – I am always adding items to my cabinet and I am definitely always using stuff. The rescues make sure I use my medicine cabinet! For me, aquarium salt is a must. It helps prevent many fungal infections that can just pop up. It also aids in preventing ick and popeye. Of course, it is not 100% positive to work but I am sure it helps prevent a lot of problems that otherwise would take over the tank. 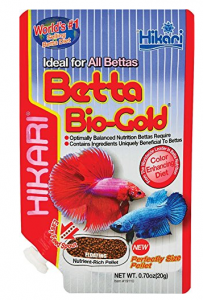 I always keep one sleeve of extra Hikari Betta Pellets in my kit as well as betta flake food and every other betta food I have tried. Bettas are picky eaters and you never know when a rescue is going to prefer flakes over pellets. As a rescue it is more important to me that they eat food in general – not that they eat pellets. I can wean them over to pellets later. Brine Shrimp are the only treats that I give my bettas and I do not feed it often. I use it to supplement the diet when I am weaning the betta over to pellets and to encourage new rescues to eat. Many of them are not used to a regular diet and they do not understand why they are getting food on a regular basis. Brine Shrimp can be a cause for ick and swim bladder. The ick is not killed in the freeze drying process but the risk of passing ick to your betta because of the brine shrimp is a low occurrance. Freeze dried blood worms are more likely to pass ick on. Jungle Fungus Eliminator is my big gun of antibiotics. It comes in a pill type bottle and is in a yellow crystal form. It is used to help treat cotton fungus, sores, greying skin, bloat/dropsy, fin rot, mouth rot, filmy eyes, red stress streaks and swim bladder. Not a bad medicine to me and I have always had luck using it. I generally treat the water for a new betta (rescue or not) with JFE for 2 days and then put them in regular treated water. Helps prevent anything that might otherwise be a disaster. This is something I use primarily for my larger tanks. It helps prevent the overgrowth of algae in any tank but I do not use it for anything under 10 gallons. Ick (or Ich as some people like to spell it) is a parasite that looks like a small white dot on your betta. There are many treatments for ick but I like the Jungle product because you do not have to raise the temperature of the tank. And because most bettas live in smaller tanks (1-5 gallons) you do not want to mess with heating the water up and risk boiling your fish. The Jungle Ick Guard Product is a liquid that comes in a small bottle that reminds me of a liquid you would use to squirt in your eyes (no, do not squirt this in your eyes LOL). Of course, if your betta is very ill or has missing scales, you will want to stock up on Jungle Ick Guard II. It is not as strong but still gets the job done. 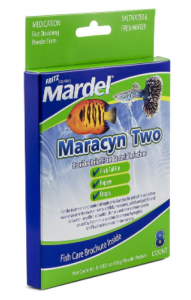 Maracyn aids in curing fin rot, popeye, gill disease, dropsy/bloat, red streaks and internal infections. You can see the difference between this and JFE but both are very hardy antibiotics. I love them both. The only downfall I have had with the Maracyn II is dosage size. Because it comes in a tablet form, you must break it up for the smaller tanks. I do hope Maracyn comes out with smaller dosage sizes for smaller tanks. This is a “pretty” chemical I use in my larger tanks as well. Many times when you are first establishing a tank or adding a larger decoration you might not get it rinsed off well enough and sometimes, the new item will cloud the water. This is a chemical I have rarely used but when I do use it, it clears the water fast until I get the time to change the tank again (usually 2 days). It is not a harsh chemical as far as the fish go and it works wonders. Aquari-Sol is used to treat many problems but I only use it for Velvet. 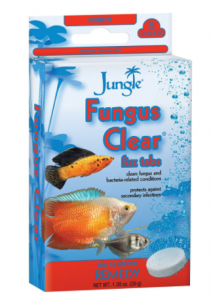 It can treat Ick, clamped fins, fungus, sluggishness and Velvet. The reason I do not use it often is because you need to increase the temperature of the water. Now – it can be used as a disease preventative and you do not have to raise the temperature of the water. I do not use it as a preventative measure (aquarium salt for that) but it does work well when used on disease. The reason I only use it for velvet is because my JFE works on everything else listed. I also feel if a betta is sluggish it is for some other reason that needs to be addressed rather than just a generic dosage of Aquari-Sol. I am not naming any brands here because I have used many brands through the years I have been keeping bettas. All work wonders. Just make sure on the front of the bottle it expressedly says “Removes Chlorine ….” That is the important words you need to see. Some stress coat chemicals do remove chlorines and nitrates but not all. Make sure you have a dechlorinator. These are the only products I have used for my bettas and as you can see by all the pictures on site, these products alone can work wonders! I am worried about my male Betta, less than a year old. He appears to have developed a swim bladder disorder of some kind…he will swim in circle to the right. Occasionally he either has a seizure or decides to try to attack his own tail. I have move him to s shallow tank without substrate. I recently added an algae eater and a snail to his tank. Does this have anything to do with things? Have I over fed him with three or four pellets twice a day?